Sara's Tearooms01493 845546work Group Eating OutSara's Tearooms is a family run, dog friendly cafe focused on delivering great service & quality food at value for money prices. Based within Pleasure Beach Gardens, we are located at the Pleasure Beach end of the seafront, right on the edge of Great Yarmouth's South Beach. From freshly ground coffee to delicious clotted cream teas, lite-bites to main meals, our menu offers a wide variety of choices including many homemade meals and cakes. Special prices for groups are available on request, we are sure to be able to tailor a package to your requirements. "When we say 'homemade', it's genuinely homemade by us." Cakes and homemade meals are Sara’s speciality, with every cake and homemade special ever sold at the Tearooms being personally baked by Sara herself. "Relax and enjoy the experience"
Our newly refurbished restaurant area is a perfect place to escape from the hustle & bustle of the seafront. Our main room seats 57 with our back room seating 32. On a warm day you can also dine alfresco style in our Gold Award winning flower gardens area or alternatively on our covered beach terrace with unobstructed sea views and direct access to the beach. Our flower gardens have picnic table seating for 60 and our beach terrace can seat 28. Our team of World Host trained staff are passionate about getting things right and aim to deliver an outstanding experience to all groups, big or small. Sara’s Tearooms is open from late March to October. Car parking with a charge is available within a 200 metre walk, but we do offer free cycle parking for our customers. Regular visitors can benefit from our loyalty card, which rewards you with a fantastic money saving offer. 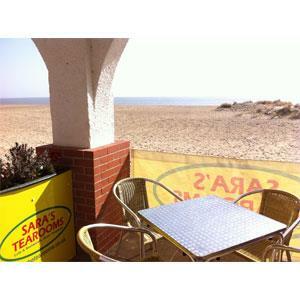 Sara's Tearooms is a family run, dog friendly cafe focused on delivering great service & quality food at value for money prices. Open daily from 10:00am from the end of May to late September, Easter & October Half Term School Holidays. Open late on Wednesdays for the seafront's Summer Fireworks Display. Opening times are weather permitting, see our website www.thetearooms.co.uk/visit for current opening times. Last meal orders taken 30 minutes before closing. Private events and group bookings available (upon request) outside of our normal opening dates/times. Special prices for groups are available on request, but we are sure to be able to tailor a package to your requirements. Situated on Pleasure Beach Gardens on South Beach Parade. St Nicholas Car Park is opposite, with disabled parking and in addition on street parking on South Beach Parade. Most dietary requirements can be catered for upon request, please speak to a member of our staff to discuss your needs.